As I’ve shown and argued elsewhere, capitalism and audit culture combine with our need for personal worth to create a “desire for more,” a deeply engrained motivation to excel in metric terms whenever we are quantitatively measured or evaluated. Get More is an experiment to test the limits of this desire. When our academic performance is measured with test scores, or our job performance is measured by sales figures, our “desire for more” is easily manifest: we want our numbers to be higher. But what happens when the metric we’re presented has no explicit explanation or obvious personal connection? What is the barest amount of information required to activate the desire for more? Get More attempts to answer this question. 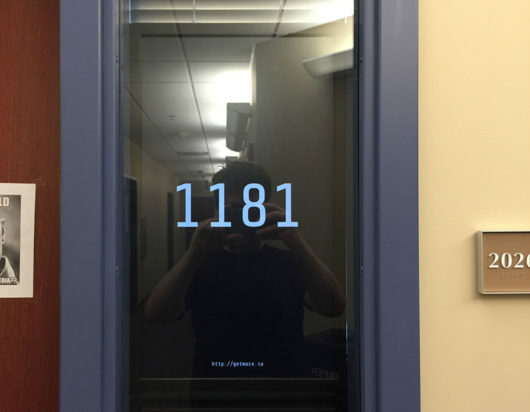 The work has two components: a physical installation that displays a metric and website address, and a web-activated incrementer of that metric. The interaction is simple: a visit to the website increases the metric by 1. Those who encounter the physical installation and then visit the website (say, on their mobile phone) will see the visible metric change before them. But the installation is tucked away in a university building where few see it. For everyone else, I have posted occasional photographs of the installation on social media, along with terse instructions such as: “a visit to the website http://getmore.io will increment this metric.” Since installing the work a few months ago, a few people have seen the installation and incremented the metric one or more times while standing in front of it. But the bulk of the increments have come from offsite visitors, from individuals who get no immediate feedback and no assurance that their visit to http://getmore.io is doing anything at all. Despite most visits coming from remote viewers, the number continues to go up. A small percentage of visits to the website are from those standing in front of the installation. For them, there is possibly some satisfaction gained through the interaction of loading the website and watching the result. But most visits to http://getmore.io are from those who encounter the work through social media, who only get a photograph of the installation from a previous point in time. Why might either of these groups care to increment a metric that counts nothing more than those who incremented it? How little information or context is required before others want a number to get bigger? In other words, what do we get when we get more? This work is one attempt to explore these questions.